Tomato lovers rejoice, for now you can celebrate these delicious orbs of sweet majesty at all meals. This is truly the ultimate tomato dessert given that a) there aren’t too many others in competition and b) it is as simple as it is wondrous. “Tomatoes for dessert?! ?” you scoff. What better way to enjoy the sweetness of a tomato than in a simple tart brushed with currant jam until a rich, garnet color and then baked just enough to release the natural juices and crisp up the delicious tart crust? You’re welcome. I first had this dessert with my mom at the restaurant Tosca in DC, and after the first bite, we totally understood how commonsensical it was to use tomatoes for dessert, particularly heirlooms. 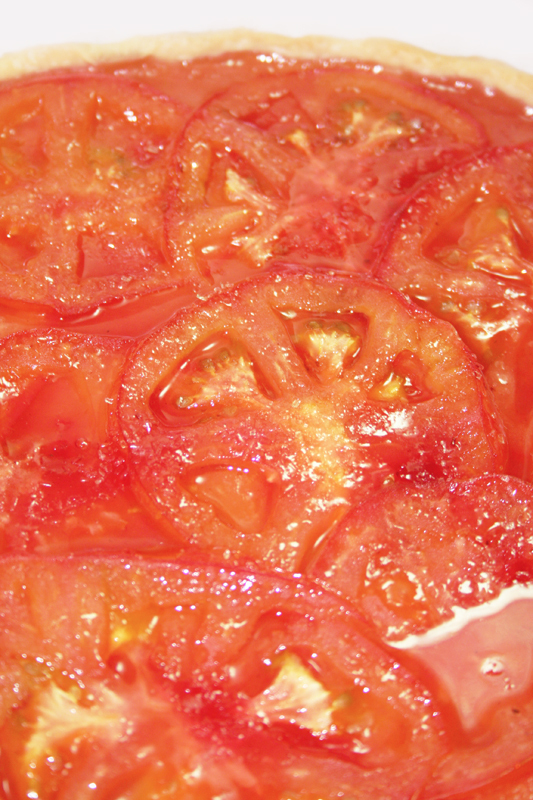 For those that don’t know – there are two main types of tomatoes: heirlooms and hybrids. Hybrids are the most common – they grown all year round and produce several crops of tomatoes throughout the growing season. The tomatoes (and sorry if I am getting dorky here) are created through self-pollination, meaning that a farmer/scientist/botanist/whatever can control what specific traits that the tomato’s offspring will harbor. This has resulted in hardy, disease-fighting tomatoes that can be enjoyed whenever and wherever. The rarer heirloom tomato is created through open-pollination, as occurs in nature – bees and other pollinators pass on genetic traits from various types of tomatoes, resulting in wild cross breeds that are hard to genetically track and control. The tomatoes come in wild arrays of colors, shapes and sizes, and typically only give off a single crop per growing season. They can be bumpy, even ugly on the outside (some grocery stores actually call them “ugly tomatoes”, but cut into one and you’ll find the juiciest, sweetest flesh that you could possibly imagine. These are the tomatoes that make people fall in love with them. They are our oldest tomatoes as well – many of the strains were grown by the indigenous peoples of not only the continent of North America, but also around the world. For this recipe, I encourage you to go out and find some heirloom tomatoes that look special to you – pick a fun color like the dark purple of a Black Krim, or the sunshine bright Brandywine Yellow. You could even try one of the striped varieties for a best-of-both-worlds situation. They’re really worth a trip to the Farmer’s Market just to check them out. Of course, if you can’t find heirlooms, you can absolutely make this tart with a juicy, meaty hybrid tomato – just find the best ones available and treat them lovingly when assembling the tart. It’s all good at the end of the day! Slice tomatoes as paper-thin as possible (thick tomatoes won’t cook properly) and carefully lay them on a paper towel to dry them a bit. You’ll want enough slices to cover the pie crust in one even, semi-overlapping layer. In a small saucepan over medium low heat, melt the currant jam. If the jam has pieces of currants in it, strain them out. You can actually save these little currant pieces as a topping for ice cream or a sweet treat. I actually use them like caviar (ha!) on top of a cracker spread with my mock boursin cheese recipe for a little taste of sweet and savory combined. Roll your pie crust out into a 9″ tart pan, making sure not to tear any holes. Lay your tomatoes out on the crust in overlapping concentric circles, making sure that the whole thing is pretty and even. Using a pastry brush, apply a generous layer of the melted currant jam over the tomatoes. Sprinkle the sugar on top. Place the tart in the oven and bake until the crust is golden and the tomatoes are bubbly and a lovely red, about 15-20 minutes. Let rest until warm and serve with ice cream – maybe a lovely scoop of basil gelato?